KUWAIT: During its weekly Cabinet meeting, the government yesterday said it was opposed to any move “aimed at undermining its sovereignty and its laws”, amid a crisis with the Philippines over the treatment of domestic workers in the state. The government added however that it will set up a special commission chaired by the minister of social affairs and labor to follow up “on cooperation with friendly states” on the employment of housemaids in Kuwait. in February prohibited workers heading to Kuwait following the murder of a Filipina maid whose body was found stuffed in her employer’s freezer. The resulting row deepened last week after Kuwaiti authorities ordered Manila’s envoy to leave the country over videos of Philippine embassy staff helping workers in Kuwait flee allegedly abusive employers. Earlier yesterday, a senior Kuwaiti official sought to calm the crisis. “This is largely a misunderstanding and exaggeration of some minor or one-off cases,” Deputy Foreign Minister Nasser Al-Subaih told reporters in Kuwait City. “We have taken a serious stance … but we do not believe in escalation and want to remain in direct communication to resolve the problem,” Subaih added. Kuwait has also detained four Filipinos hired by the Philippine embassy and issued arrest warrants against three diplomatic personnel. Subaih said those suspected of participating in the operation to help workers escape were not accredited diplomats and that they were now holed up in the Philippine Embassy. The foreign ministry was “awaiting cooperation” for their handover to carry out an investigation. Kuwait and the Philippines had earlier been negotiating a labor deal that could have resulted in the lifting of the ban on Filipinos working in Kuwait. But after the fresh escalation in tensions, Duterte said on Sunday that the temporary ban on Filipinos going to work in Kuwait was now permanent. Around 262,000 Filipinos work in Kuwait, nearly 60 percent of them domestic workers, according to the Philippines’ foreign ministry. Domestic helpers account for more than 65 percent of the more than 260,000 Filipinos in Kuwait, according to Philippine government data. The earnings overseas workers send home is vital to sustaining low-income families and a crucial economic driver. Meanwhile, a Philippine labor group and a senator accused Duterte yesterday of gambling with the livelihoods of tens of thousands of Filipinos in Kuwait after he asked them to come home. 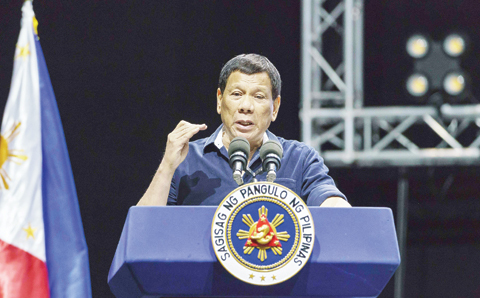 Duterte at the weekend appealed to the “sense of patriotism” of overseas Filipino workers, known as OFWs, and asked them to return home, where he said they would get financial aid and job opportunities in other countries. He added they could find employment as English teachers in China, citing improved ties with Beijing. Critics said Duterte had no way of guaranteeing that and should not ask those whose income was vital to their families back home to quit their jobs. Senator Risa Hontiveros called Duterte’s request “extremely reckless, shortsighted and uncaring”. “President Duterte should stop gambling with the lives and employment of thousands of OFWs, and the welfare of their families, in a desperate attempt to break the diplomatic impasse,” she said in a statement. Although Duterte said on Saturday the work ban was permanent, his spokesman, Harry Roque, suggested yesterday that the labor protection agreement between the two countries may still happen. Roque also clarified that Duterte “is not compelling anyone to come home”. He noted that Labor Secretary Silvestre Bello III and other Cabinet members are expected to visit Kuwait on May 7, ?which means that the process of diplomatic negotiations and conversation continues as we speak”.